The scaled-down version of Chuck Hobermanâ€™s award-winning sphere, the Hoberman Mini Sphere is an engineering wonder and lots of fun. 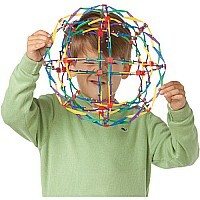 Itâ€™s geometry at play that you can throw, kick, bounce and magically expand from 51/2" to 12" with just a touch. Expand your play!